Making your own bird suet is inexpensive and easy. Besides eating all the bacon and spending $1 on a pound of beef suet, the other ingredients maybe cost $3. These ingredients are most likely already in your cupboard. You can make this recipe with slightly different variations with good results. Birds do prefer the homemade suet over the commercially made kind. Just ask them! 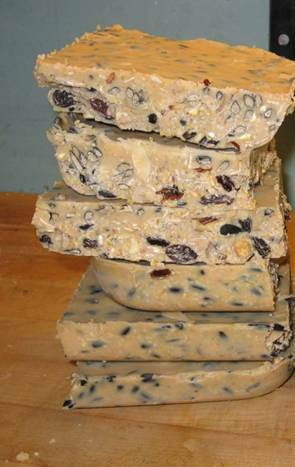 Beware - this suet will smell so good when you are making it! You may be tempted to eat it. Bacon and peanut butter are a perfect match! Alright. Let's feed the birds! 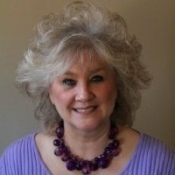 For this recipe you will use bacon fat, beef suet, peanut butter, peanuts, raisins, cracked corn, and you can add corn meal, oatmeal and whole sunflower seeds. You will want about six cups of rendered (melted) fat and will add roughly one cup of each dry ingredient. Over medium heat, render (melt) the fat. We put frozen bacon fat that had been stored in a tin can in a dutch oven to warm up the bottom of the cans for easy release. The bacon melts super fast - less than three minutes. If you use beef suet, chop it up before melting. You can use an meat grinder to get the beef suet into small pieces. The beef suet will melt quickly, too. The fat melts in about 6 minutes. 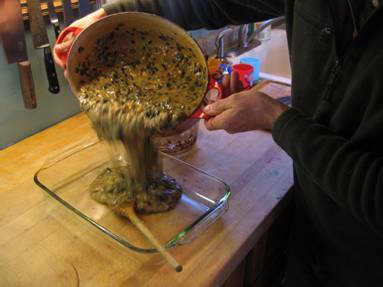 After the suet mixture has thickened, pour it into your molds. You can use a 9x13 and an 8x8 pan. Your birds will thank you for this wonderful meal! !